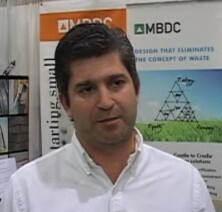 Jay Bolus, of Mcdonough Braungart Design Chemistry (MBDC), explains the importance of Cradle to Cradle certification and eco-effective design principles . By creating products and materials that can be reused and upcycled, we not only reduce our footprint but also protect the environment. These green options can be cost neutral compared to traditional choices and perform just as well. This year MBDC will focus on the consumer market to expand Cradle to Cradle offerings on products we use every day.